Little evidence of calculated reciprocity has been found in non-human primates so far. In this study, we used a simple experimental set-up to test whether partners pulled a sliding table to altruistically provide food to each other in short-term interactions. We tested 46 dyads of chimpanzees, bonobos, gorillas, orangutans, brown capuchin monkeys and spider monkeys to examine whether a subject’s tendency to provide food to a partner was directly affected by the partner’s previous behaviour, by the species, by the condition (i.e., whether the partner could access the food provided by the subject) and by the social tolerance levels within each dyad. Chimpanzees and orangutans were the only species pulling significantly more when the partner could retrieve the food altruistically provided. However, no species reciprocated food exchanges, as subjects’ probability to pull was not affected by the previous number of the partner’s pulls, with the possible exception of one orangutan dyad. Although subjects clearly knew how the apparatus worked and easily obtained food for themselves, individuals did not usually take the opportunity to provide food to their partners, suggesting that calculated reciprocity is not a common behaviour and that food exchanges are usually not reciprocated in the short-term within dyads. The online version of this article (doi: 10.1007/s10329-014-0424-4) contains supplementary material, which is available to authorized users. This work was conducted while the first author held a Humboldt Research Fellowship for Postdoctoral Researchers (Humboldt ID number 1138999). We thank Elisabetta Visalberghi, Roberto Pacheco Mendez, Fernando Victoria Arceo, Iber Rodriguez Castillo and all the animal keepers at the different facilities for endless support and cooperation. Thanks to Sebastian Egner for coding data for inter-observer reliability purposes and to Hanna Petschauer for helping wonderfully with organizing data collection. 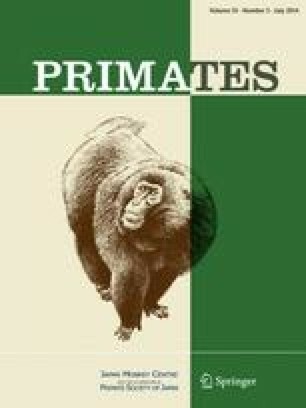 This study complies with the ethical standards as laid down by the Primate Society of Japan and was ethically approved by an internal committee at the Max Planck Institute for Evolutionary Anthropology in Leipzig, Germany.